This interesting surname being a locational name, is a dialectal variant of a place called Hanmer in the former county of Flints (now part of Clwyd), deriving from the Germanic personal name "Hagena", borrowed into the Olde English pre 7th Century, and "mere" meaning "lake" or "pond". Locational surnames, such as this, were usually acquired by a local landowner, or by the lord of the manor, and especially by those former inhabitants of a place who had moved to another area, usually in search of work, and were thereafter best identified by the name of their birthplace. 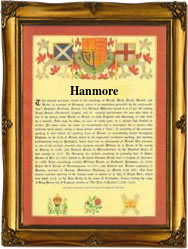 The surname dates back to the mid 14th Century (see below), and variations in the idiom of the spelling include: Hanmore, Hanmer, Anmore and Handmore. Recordings from London Church Registers include: the marriage of Jone Gryffetts and Charles Hanmer on February 11th 1570, at St. Margaret's, Westminster; the christening of Humfrey, son of John Handmore, at Mary Abchurch, on May 29th 1597; and the christening of Jane, daughter of John Hanmore, at St. Giles' Cripplegate, on November 30th 1628. The first recorded spelling of the family name is shown to be that of Sir David Hanmer, which was dated circa 1350, in "Records of Wales", during the reign of King Edward 111, known as "The Father of the Navy", 1327 - 1377. Surnames became necessary when governments introduced personal taxation. In England this was known as Poll Tax. Throughout the centuries, surnames in every country have continued to "develop" often leading to astonishing variants of the original spelling.